Perth - South African captain Graeme Smith on Monday hailed his team's second successive series win in Australia as the finest moment of his decorated career. The Proteas, forced to bat out for draws in the first two Tests, dominated the Australians in the third and final Test at the WACA Ground to post a 309-run win and retain their top ranking in Test cricket. "It's hard to describe how satisfying this feels, to have done it twice is difficult to put into words," said Smith, a veteran of 105 Tests, 97 of them as captain. "One win here seemed a very long way off when we lost 2-0 back in 2005, but now we have won twice. "It's incredible - every single one of the players can feel extremely proud of themselves. "This is the proudest achievement of my career." 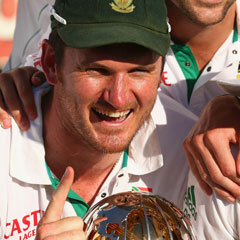 The Proteas have not been beaten away since a 2-0 loss in Sri Lanka in 2006 and Smith said the lead had been well-earned. "It is nice to go home with a six-point gap and go and play in front of our own fans on our home grounds," he said. "It has been a long haul away from home, with some tough challenges, and to come through them has been really special." Smith praised the fighting spirit of his side in regrouping after being outplayed in the first two Tests of the series. Like retiring Australian batsman Ricky Ponting, Smith pointed to the second day of the Test as the defining point in the series. The Proteas started the day under pressure after being bowled out for 225, but restricted the home team to 163, before piling on 206 runs in the day's final session on the back of attacking batting by Smith and Hashim Amla. "Day two for me has got to go down as one of the highlights of South African cricket," he said. "The way we bowled and the way we batted in that evening session to take the game away from Australia."